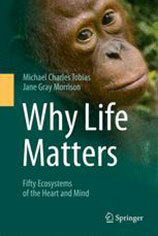 From famed ecologists and authors Dr. Michael Charles Tobias and Jane Gray Morrison comes a new book that should be on the reading lists of anyone concerned or interested with the future of life on Earth – Why Life Matters: Fifty Ecosystems of the Heart and Mind. Having written some 50 books and produced some 170 films between them, it is no surprise that this new title from the married duo is a powerful ode to life told through the lens of two deeply committed humanists. Michael Charles Tobias and Jane Gray Morrison are partners who have produced a prolific body of work that has been read, translated and/or broadcast around the world. Their research embodies field work in such disciplines as ecology, comparative literature, anthropology, the history of science, philosophy and ethics in nearly 100 countries. They run the Dancing Star Foundation, a non-profit dedicated to international biodiversity conservation, animal protection and environmental education.